New And Exciting Ways To Generate The Visitors You Need For Online Success! To Be At The Forefront Of A Revolution. Almost a year ago, the eBook Web Traffic Explained was released and it has met a great deal of success. After all, before that eBook was distributed, the World Wide Web was sorely in need of a guide that encapsulated each and every traffic generation strategy that the veteran Internet marketers were using. That the said eBook explained these techniques in a language that was accessible for everyone was a plus. You never needed to learn complex online marketing terms nor complicated formulas to understand the methods discussed in its pages. Everything was explained in simple terms. I'm talking about article marketing, forum marketing, blog and ping, affiliate programs, traffic exchange, PPC advertising and the like... things that were novel back then, things that not everyone knew about. And a year in Internet marketing is equivalent to 5 years in the real world. Nowadays, the online marketing superstars are using new techniques... strategies that are cutting-edge... tactics that you never even imagined were possible. These are the traffic-generating strategies for the new age. These are the traffic-generating strategies that will define the next decade. These are the traffic-generating strategies that herald the coming of a new era in the online world. You see, whereas, the traffic-generating strategies a year ago were exclusively focused on attaining prominent and favorable positions in search engines, the trend these days is veering away from the search engines and leaning towards user-driven categorizing systems. Search engines have their processes carried out by search engine spiders and a preset algorithm. User-driven systems use human discernment to categorize websites into appropriate topics. Hence, more and more people are starting to prefer social indexing websites over search engine results. And more and more Internet users are starting to focus on social indexing websites to position themselves well for what should be the dominant practice in the next few years. Yes, the age of the search engines is slowly coming to a close. And a new age is upon us indeed. You have gotten a taste of this new age, most likely. Have you heard about tags? You see them everywhere these days... on dating websites, on file-sharing web pages, on video streaming repositories, on blog directories. But the popularity of tags is one that is instantly dictated by user-initiated actions, in real time at that. They don't have to pass through the complicated algorithms of search engines. If a tag is hot, you'll immediately see it. Hence, the development of new and exciting strategies that can rake in tons of traffic for many websites. These are strategies that are revolutionary. Not everyone knows about them. And those who do would rather keep the knowledge to themselves. In this new edition, you will discover the tactics of tomorrow. This eBook contains the new breed of strategies that will grace the headlines in the coming months. This eBook is a collection of the strategies that quite a number of people have labeled as the next big thing in Internet marketing. Social bookmarking websites and how you can capitalize on them. With the knowledge you will learn, you'll be able to display your links in prominent areas without having to be subjected to the whims of the search engines. Tag and ping. This is the perfect complement for your blogs. Blog directories are obsolete; hence, the blog and ping tactic is not as effective as it once was. Nowadays, if you don't know the tag and ping tactic, your blog is useless. A website that can send hundreds of thousands of visitors to your pages overnight. Want a clue? Will you be able to "digg" it? Viral video marketing. Still using eBooks and special reports to power your viral marketing campaign? Do more with less time using videos instead. This lesson will teach you how to create your viral videos and where you can plant their seeds for the most efficient results. How to harness the potential of social networking websites and transform them into quality traffic for your online business. Sites like MySpace(TM) and Friendster(TM) are big these days, what with the many hits they receive everyday. This eBook will show you some tips and tricks on how you can gain a big share of that pie. Automatically generated content. Content is king on the World Wide Web, but coming up with fresh content on a regular basis is quite a difficult task. This eBook will show you 5 techniques that will allow you to encourage your visitors to do the writing for you! Six new and powerful strategies, all in all. Have these strategies been discussed in other publications? Yes they have, but individually at that. Web Traffic Explained, Volume II is the ONLY resource that includes all the newest strategies in one tome of amazing information. You won't have to purchase 6 different resources to learn these revolutionary methods. With this single eBook, you'll be able to catapult your business to the forefront of a revolution... one that will change the online marketing landscape in the coming months. The future is coming and this guide will help you prepare for it. 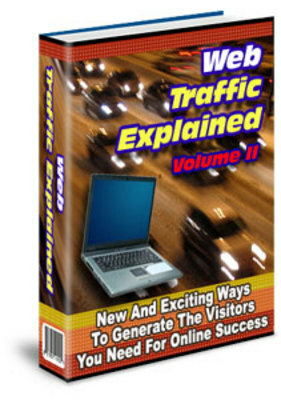 Web Traffic Explained Volume II web traffic;web traffic generation 115180662 21.00 best-books Fresh Download Available!